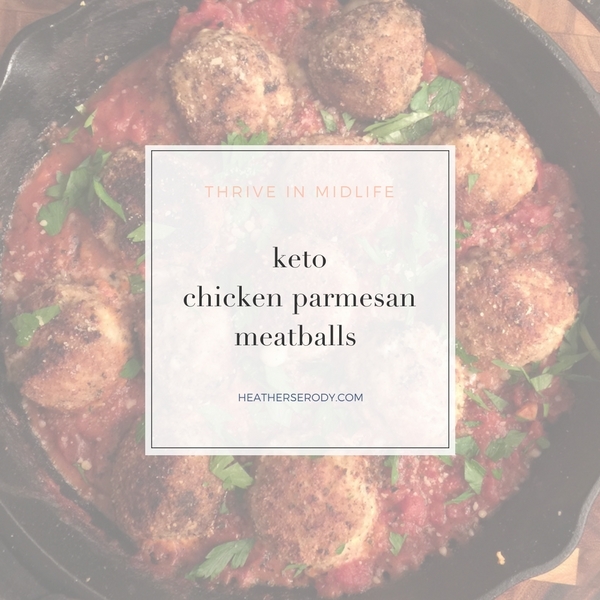 One of my favorite things to do these days is to recreate yummy traditional recipes to make them keto-friendly by swapping out ingredients. 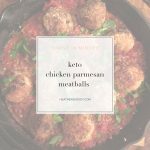 #2: that this would be a recipe that was easy to make keto-friendly. The main thing is to swap out the breadcrumbs & flour used for ‘keto breadcrumbs'. What are keto breadcrumbs & flour you ask? Easy! Just take a bag of natural pork rinds (check that they don't have preservatives or weird ingredients) and waz them up the food processor or put them in a big ziplock and pound them down with a mallet or rolling pin into ‘keto' style breadcrumbs/flour. This trick works for anything that you want to coat in flour or breadcrumbs. If you prefer a more traditional preparation you can find that original recipe and Gaby's full-of-deliciousness blog called What's Gaby Cooking HERE, but I swear these are just as good, and without the added carbs. In a large mixing bowl, combine the chicken, parmesan, 1/3 C of the pork crumbs, eggs, salt, pepper, oregano, parsley and red pepper flakes. Combine with your hands until mixed. Form the ground chicken mixture into meatballs. I use an ice cream scooper to make them evenly-sized. Preheat a large heavy bottomed pan (preferably cast iron) on medium heat. Push a small mozzarella ball into the center of each meatball with your finger, then close the hole around the cheese by reforming it. You should not be able to see the mozzarella. Place remaining 1/2 pork crumbs in a shallow tray or bowl. Roll each meatball in the pork crumbs until lightly coated. Add avocado oil to preheated pan. Once the oil is hot, add half of the meatballs and sauté for a 3-4 minutes, turning every so often to brown the outside. When the meatballs are browned, remove them from the oil to a plate and brown the rest of the meatballs. Once all meatballs are browned, add the tomato sauce to the pan and place all the browned meatballs on top of the sauce. Transfer the pan into the oven and continue to bake for 15-20 minutes until cooked through and the mozzarella inside the meatballs is melted. Remove the skillet from the oven. Check for seasonings and top with fresh shredded basil and some additional parmesan cheese.